Scotch® Vinyl Electrical Tape 35 is a 7-mil thick, premium-grade, color-coded electrical tape. This flame-retardant tape is suitable for use in phase identification, color coding of motor leads and piping systems and for marking safety areas. This tape is 600V-rated and withstands a temperature range of 32 to 221 degrees F (0 to 105 degrees C). Scotch® Vinyl Electrical Tape 35 provides electrical and mechanical protection with the combination of an aggressive, pressure-sensitive, rubber-resin adhesive and an elastic PVC backing. This tape is flame-retardant and is highly resistant to abrasion, moisture, alkalis, acids, solvents and varying weather conditions. It stretches easily and adheres virtually in any shape. Ideal for insulating electrical wires and is compatible with synthetic cable insulations, jackets and splicing compounds. UL Listed, VDE, CSA Certified and RoHS 2011/65/EU Compliant. 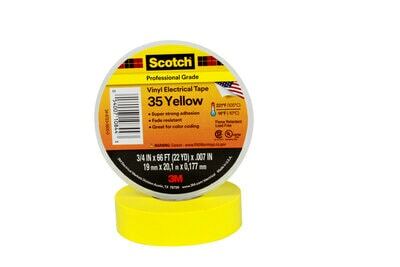 Scotch® Vinyl Color Coding Electrical Tape 35, 3/4 in x 66 ft, Yellow, 10 rolls/carton, 100 rolls/case is rated 5.0 out of 5 by 2. Rated 5 out of 5 by TNTMAC from Superior color coded vinyl electrical tape I tried a white electrical tape that was made in China. It didn't stick well and became brittle. (see first 2 pictures) I bought 5 rolls of color coded 3M Scotch Vinyl Electrical Tape to replace the old tape. The Scotch sticks securely to plastic and is superior. (see last picture) Scotch is the only electrical tape I will purchase! Rated 5 out of 5 by Randy3030 from Best tape I've been using your tapes for decades. I don't even consider other brands anymore.